Nick surprised Chlöe with the gorgeous diamond set Abbraccio. Nick surprised Chlöe with this gorgeous diamond set engagement ring. Queuing to step out on to the glass viewing platform at the top of the Aiguille Du Midi in Chamonix, Chlöe mused "I wonder how many people propose up here? ", coolly Nick deflected "I don't know, how many do you think?"... A few minutes later, at 3842m above sea level, above a 1000m drop Nick presented a gorgeous 1ct diamond set ring... Spectacular! Nick surprised Chlöe with the gorgeous diamond set engagement ring. Inspired by the Italian word for Hug and Protect. Abbraccio features Four Claws that twist to secure the round diamond at compass points. 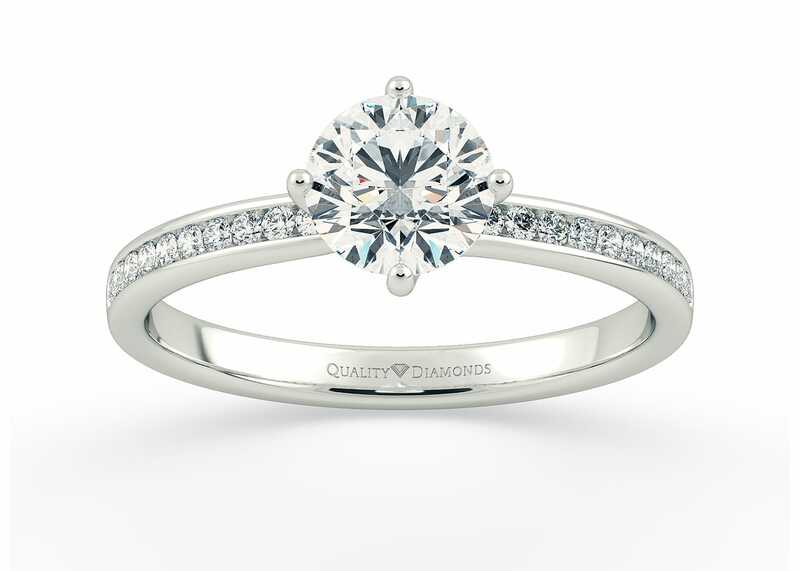 The delicate prongs are positioned to maximise light passing through the diamond and produce the most exquisite sparkle. Eighteen Round Brilliant diamonds are channel set in to the shoulders covering the whole of the top of the band in sparkle. We've created 2 recommendations for you to consider. The first features an Ultra quality diamond set in the diamond set Platinum Abbraccio. The second option is for the more budget conscious, we've tweaked the diamond criteria slightly to find a beautiful stone in white gold. Don't forget! We can work to most budgets, so contact our Diamond Experts for a more personalised search.